Hi, my name is Wesley Abrams – Finance major on exchange in the Netherlands. In this post I hope to share some pointers about studying abroad in general and with respect to The Hague. 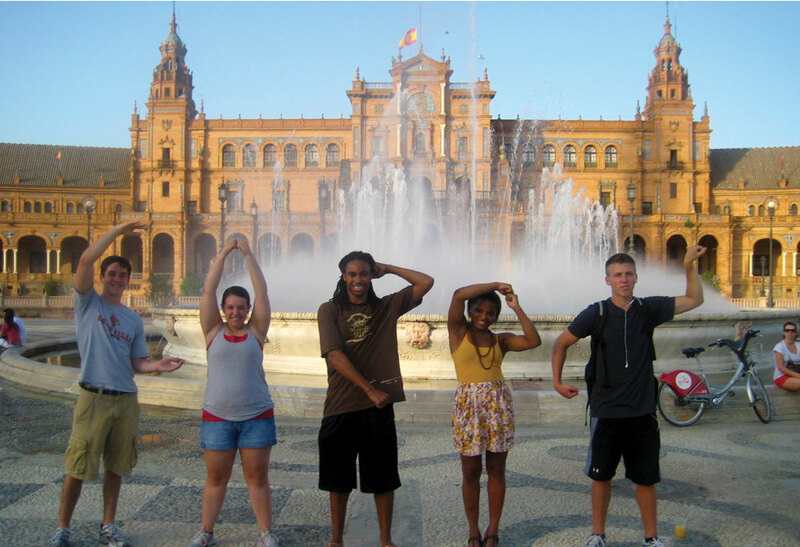 I hope to provide information that will make your decision about where to study abroad easier. Furthermore, Iâ€™m going to cover my 5 Lâ€™s to choose The Hague University of Applied Sciences. a.	I would venture to say that a majority of students planning to go abroad have yet to visit the region they plan to study in. Quite frankly, even if you have traveled in Europe â€“ or somewhere else â€“ nothing can really prepare you for the wayward feeling of walking through an airport having no idea where you are. Being lost is something you have to get acquainted to on exchange â€“ especially if you want to travel â€“ but itâ€™s not always a bad thing. There are clandestine benefits to wandering about and stumbling upon things you otherwise would miss. Relatively quickly, unless youâ€™re in Venice, one begins to grasp the natural human disposition for cardinal direction and the seemingly prehistoric prevalence of printed map usage. While this is all true, it doesnâ€™t eliminate the desire to travel with ease. And, in my experience, the Netherlands excellent infrastructure of transportation allows that. that url is the extent of your walk from the train station to the university, and the Red Tower â€“ where I recommend to stay â€“ is only about 2 minutes from there. Not having to leave the airport in order to catch a train and being dropped off within in minutes walking to your final destination is about the greatest thing that could happen at this point in the journey. ii. Bike travel is extremely popular in the Netherlands and is probably the best means of permanent transportation once your settled. However, while you are getting used to things and havenâ€™t scoped out the best deal for a bike, the tram system in The Hague is pretty intuitive. There are detailed maps at each stop that tell you the path each travels. The beauty of it all is, OV Chip Cards can be purchased at the train station and preloaded with money, thus itâ€™s on a need to use basis. You just swipe the card when getting on and off, never really paying more than 1.50 euro to get anywhere in the city. a. Pretty much all Dutch people speaking English well, which can be inferred from the airport staffâ€™s fluency. Itâ€™s possible to run into a few problems with immigrants running convenient stores and restaurants â€“ but it always works without you feeling too stupid. Iâ€™m not saying living somewhere with a higher language barrier isnâ€™t rewarding, itâ€™s just not as easy. Also, this benefit is quite fruitful when asking for directions before youâ€™re acquainted with the city. b. The university offers a course in Survival Dutch that helps you get through most binds. It doesnâ€™t pretend that a language can be learned in 5 months, so you get what you need. And, you leave feeling at least a little more cultured. a. One great thing about The Hague University is that U of L COB students are eligible to do a full exchange. Meaning, all of your approved credits transfer with ease. Also, for finance and marketing majors, there is a plethora of advanced courses available that donâ€™t impede on your path to graduation. b. Have you seen the campus? Imagine a completely indoor campus that houses 22,000 students as an outdoor one would. For lack of better words, itâ€™s pretty incredible. If you havenâ€™t checked it out, use Google images or take a virtual tour on their website â€“ hhs.nl â€“ before you finish this paragraph. My diction or prose really canâ€™t do this complex justice. c.	The IBMS (International Business and Management Studies) program has many exceptional professors. Also, the learning environment is different. First of all, group work is a staple. Love it or hate it you need exposure to working in teams â€“ even if itâ€™s difficult. Once you enter the workforce there is no doubt that teamwork is necessary and you might not always see eye to eye with your partners, thatâ€™s just life. Second, in most courses, the teacher-student ratio is much smaller than that of U of L – which expands upon the way you are used to viewing the classroom. Third, professors are genuinely helpful to exchange students. For example, two of my books were given on loan from a professor to avoid paying high retail costs. a. If you are planning to travel, there is really no better place to set as home base. Besides the fact you live right next to a train station that goes directly to the airport, the Netherlands is a pretty central location to travel from. In turn, this allows for you to find cheap flights to many destinations across Europe. Websites like easyjet, skyscanner, and edreams are extremely helpful. b. If you want to take buses or trains destinations like England, Spain, or France arenâ€™t out of the question. In the end, flying is almost always the most practical way to get around. a.	Youâ€™re first thought when thinking about studying at The Hague probably isnâ€™t that there is a beach. I know for a fact it wasnâ€™t mine. In actuality though, there is a beach and its quite scenic. The temperature is a moderate, and there isnâ€™t typical beach weather you are accustomed to. Albeit, there is a special feeling when you visit this particular beach. I donâ€™t know if itâ€™s because itâ€™s so different than what you have seen â€“ didnâ€™t even know beaches could have that much variety or a distinctive and special aura. Overall, the atmosphere is just relaxingâ€¦the people are very relaxed in demeanor and the whole area just seems to have a slow pace. As if time it self ceases to exist. b.	Biking is extremely efficient in The Hague. Pretty much every road has a path to separate bikers from traffic and make travel hassle free. And, if you forgot how much fun riding a bike is youâ€™re missing out. For me, itâ€™s one of those basic thrills that take you back to innocent childhood fun. Even better, you can bike to the beach in about 25 minutes â€“ which lets you take in the scenery and get some exercise. c.	There are tons of movie theaters if you are having a slow night. All movies are shown in English, which – as you can imagine — is a plus. Typically, I want to understand whatâ€™s happening in a film I pay to see â€“ could just be a personal thing. d.	Amsterdam City Center is about a 45-minute train ride. Of course, being a massive city, it provides for extensive means of entertainment. And, the city itself is an architectural playground. If you like cool buildings, Amsterdam has pretty much every type. Not to mention the city, like many places in the Netherlands, has its own special vibe. My name is Nambi Arumugam and I am currently studying abroad in The Hague, Netherlands. I have been here since the third week of January and will be staying until the first week of June. It has been about two months since I have gotten here and so I finally feel as though I have had enough time to get a small grasp of the city and country. This blog post will mostly be dedicated to what to bring to the Netherlands if you plan on studying abroad here. More specifically, I wanted to mention some of the little things to bring to make your time here that much more comfortable. I packed as lightly as I could for a 5-month trip but brought some things that made the transition a lot smoother. First, I brought a small Swiss army knife (be sure to check this in when flying here). It had a variety of tools on it including a small screwdriver, bottle opener, knife, and flashlight. Any small things that broke or any screw that was loose, I could fix without having to go and give a work order at the dorm office. For example, our showerhead was loose and would never stay up. With some work with the pliers that were on the army knife, I was able to rig it to stay up. The second thing I would advise is to bring any of your favorite brands. There are stores where you can find brands that are being sold back home but they are usually out of the way or very expensive. Most of the stores sell the Dutch version of the brands we have back home but most of the labels are in Dutch and figuring it out takes some experimentation. Small locks are something that I wish I had brought to the Netherlands. They are incredibly useful when staying in hostels or keeping valuables safe inside of your room. While the dorms and living areas in The Hague are very safe, it brings about a peace of mind when traveling for extended periods of time. When in the dorms, I found that most of the dorms give you a locker but make you pay for renting a lock for it. This becomes relatively mandatory when you are sharing a room with up to 23 other people sometimes. If you have a lock of your own, you know it is of better quality than the ones usually rented at hostels and having a unique lock may be a good idea. Finally, a small, fast drying towel is a very good investment before coming abroad. While a large one may be great for keeping in your room, when traveling, it will be a pain to lug around. A smaller towel also takes up less space in your bags which helps greatly considering inter-continental flights usually only allow a carry-on bag. That is a small list of some things I recommend you bring. I will update this entry any time I think of more items that I feel would be smart to bring. First stop, Ghent! I did a little background on the city before our departure and found that Ghent is the 3rd largest city in Belgium (almost 600,000) and displays the largest â€œautomobile freeâ€ zone in the entire country that is directly within the city. Naturally, I came to anticipate a great deal of walking, but I was interested at how such a large city (larger than within the Louisville limits) can operate with no cars! It was in the Antwerp Centraal train station (connecting train from Holland to Ghent) that I experienced my first Belgian waffle with my Canadian friend, Kate. Only having to pay â‚¬1.50 at a track-side concession stand, my expectations were not all that high but it was still incredible and very delicious. I can only imagine these things made fresh for breakfast. Arriving in Ghent on a bleak, rainy day, we soon realized that we shouldâ€™ve gotten off at the previous station. Nevertheless, we trudged up towards the city center for around an hour, sightseeing the entire way. Immediately we began drawing comparisons to Den Haag, back in Holland. Itâ€™s incredible how you can travel 90 minutes and see how the landscape, the people, and the architecture all completely change! Much wealthier than Holland, I instantly recognized the luxurious, past lifestyle of the cityâ€™s inhabitants. Signs of deep, personal, stone engravings marked many of the shopsâ€™ cornerstones. The buildings were pleasantly adorned with gothic-styled charibums and ornate fixtures that proclaim their once-significant stature. One in every four stores would be a jewelry store or boutique that overlooked the canals that line the city (Antwerp, Brussels is known as the diamond capital of the world). As we neared the city you could gradually see the buildings as though you were stepping into a time machine. Three imposing cathedrals, dating the 17th century, tower over all as they guard the city center. Everywhere we turned reminded us of something from Medieval eraâ€¦not in a touristy, Disney World way. After we had enough pictures we made our way to our hostel that was a 10 minute walk from the city center. That is when we met Gravensteen. What we toured was the castle that defended the city from the late 12th century from against foreign invaders. Remarkably intact, we were able to walk around and learn about the warfare, weaponry, and population of that time period. The view that over looked the city, even on a rainy day, was truly breathtaking (see photo album: Ghent, Belgium). That night we enjoyed some fine Ghent dining and our first steak of the trip. Meals here, as Iâ€™ve heard about in Southern Europe, are meant to last a while. Tipping is not common; therefore, servers take their time and work in a very slow pace. After dinner we went to this famous bar called Bierhuis, â€œBeer Houseâ€. This place was AWESOME. The beer menu was leather-bound and roughly 13-15 pages. By the end of the night we were asking for shots of strange liquor kept in a ceramic jug, poured by none other than Santa Claus himself. I may never drink Bud Light again. After a few hours of sleep we somehow boarded a train to Brussels the next morning. Arriving in Belgiumâ€™s capital city, Brussels was a sharp change of contrast from the quiet, picturesque Ghent. Brussels was a booming metropolitan area full of automation, industry, and history. Again, the vast buildings spoke volumes of their history, but much more modern than Ghent. We visited a number of monuments as we criss-crossed our way to our room to check in. Cool Fact: Our hostel was the old workshop/home of Vincent Van Gogh during his time in Belgium. That afternoon we met in the classical town square in the middle of the city for the highlight of our trip, the Belgian Beer Tour! Now there are very few things that Belgium is known for on a national scale. Beer is definitely one of them. Our tour guide, Alberto (http://www.facebook.com/photo.php?fbid=10150578855539185&set=a.10150578821279185.399649.758734184&type=3&theater), was one of the most intelligent, fun-loving people that Iâ€™ve ever met. When signing up for this tour we expected to drink, and learn about beer. What we did not expect was to get detailed historical account of the city Brussels AND Belgian national history as we passed all the important landmarks! Our first stop was the world renowned bar, Delirium. Claiming to hold stock to 2,000+ beer, Delirium offers a collection that can be found in no other bar or pub in all the land. It was decorated in true American Picker-style with hundreds of antique beer memorabilia and porcelain signs littering the walls. It reminded me a lot of The Tavern justâ€¦.a lot nicer and a little more touristy. To the second stop we traveled to the edge of the city and visited famous Cantillon Brewery. This is the oldest, and still operating, brewery in Belgium, still passionately managed by the same family for 4 generations. Narrowly escaping bombing during WWII, the brewery almost resorted to closing its doors forever when business became so slow. Only after adding a museum to the brewery did numbers slowly begin picking up. They let us try a few types of their famous brew. So lets go back and think of your favorite beer. Is it Blue Moon? Maybe Stella Artios? Guinness? Amberbock? If all of these wanna-bes mated and their offspring were gently fed the sweet nectar of Zeus until the age of 6, this would be the delicate, most perfect result. I cannot paint a picture worthy of portraying the grandeur of this flavor so I will move on. The final stop came to a place (I forget the name after many 10-12% beers) where there were no brands. No signs, no labels, nada. This was a true beer-lovers establishment that did not wish to influence you with propaganda or advertisement. Instead, a menu was given to you that had different tastes that were vividly descriptive with an appropriate summary of this mystery beer. Only when you received the beer did they reveal the blind dateâ€™s identity. It was a very cool place that ended our fieldtrip in style. The next morning we toured the scenic area of downtown, stopping by the large St. Michaelâ€™s and St. Gudulaâ€™s Cathedral before we skipped town. Talk about a very eerie mystique. This massive structure took 300 years to build! Very reverently, we tip toed around and snapped pictures of the dozens of stained glass windows that depicted biblical scenes. The Gothic architecture of pointed arches, high, vaulted ceilings, and flying buttresses that became so famous in the 13th, 14th and 15th centuries was on full display, showing the true youth of the United States. In these days, commoners were feared or fooled into religion by priests who promised forgiveness and acceptance to heaven for payments. The Church quickly grew into the most powerful entity around, as shown in their buildings in which not one expense was left to consider. We left in a very majestic-feeling state. We were very exhausted after only three days and couldnâ€™t wait to get home to The Hague. We have trips planned soon for Amsterdam and Germany! â€¢	My Australian friend, Nick, is taking me to a local rugby practice this week and teaching me how to play. â€¢	Nambi tried to jump out of a moving taxi at 5am. If you ask him, heâ€™ll claim that you know as much as he does about the night. â€¢	The meat here isnâ€™t real meat. Iâ€™m not sure exactly what it is, but something just isnâ€™t quite right. Iâ€™ll need to examine the problem further as Iâ€™ve only found one decent burger since arriving.